For the love of DIY, design and doing what we love – we are back! About to get into what will be our next renovation project – one with a bit more planning and ‘behind the scenes’ work to get started. But one which we think can be our best yet. And we are VERY excited to get started! We know - September 2016 was over a year ago! Why haven’t we announced this project sooner? Are we slowing down? Have we finally realised real life isn’t like The Block NZ? Well, while we were hoping to be started by now, the reality of dealing with a project of this size means we couldn’t just get stuck in – there has been a lot of what Alice calls “property admin”. The last year has been used for surveys, engineering, planning, finding the right house and plan for the site, consents, dealing with council… We decided to tackle the subdivision and consenting first, start on the new dwelling and then renovate the existing house, one at a time. It’s all been a process that takes time and one that would have been weeks between updates. So, we decided to get everything lined up before we began sharing this project. We will bring you up to speed in the next couple of weeks and then hope that the renovation itself speeds up too! But first, here are some details on what we have got our hands on. The house is located in Otahuhu, Auckland. A vibrant suburb, multicultural community, and well positioned being 13km from the city centre. There is plenty of character in the suburb with many older bungalows and villas around and new life coming into the area with many of these being renovated in recent years and the council investing into the local town. The house was built in the 1930’s, looking tidy on the outside but nothing fancy inside or out. 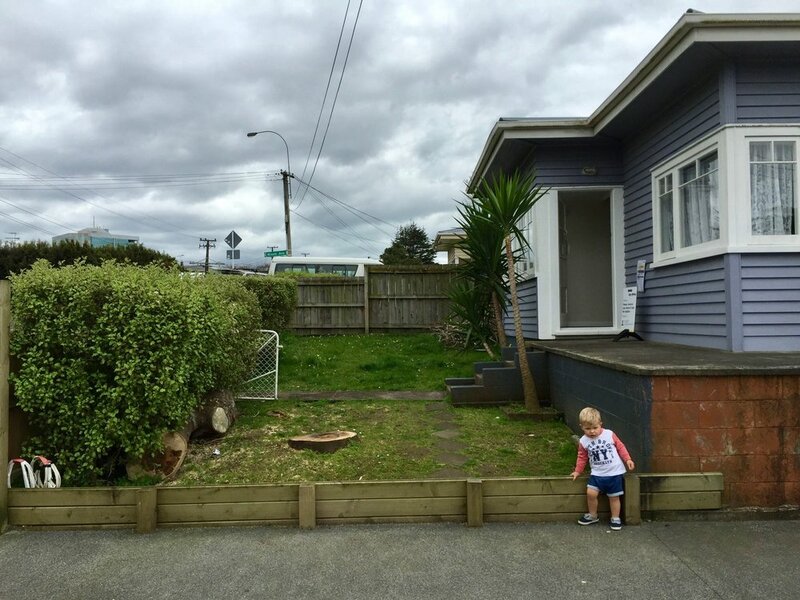 The section is not big, 674m2, but with this being a corner site with two street frontages and the recent changes to zoning in Auckland (now zoned Mixed Housing Suburban) – this property was now allowed to be turned from 1 to 2 properties. We purchased it for $770,000 and was rented at $580pw (3.9% gross yield). 3 bedrooms, 1 bathroom, separate kitchen and dining, approximately 90m2. Here are some photos from when we first went to view the property, we made our offer 3 days later and within the week it was accepted. Posted on October 5, 2017 by Caleb Pearson and filed under Renovation and tagged relocatable reno Alice and Caleb renovation property.